Move over, Ubuntu Touch and Android. There's new competition in town. 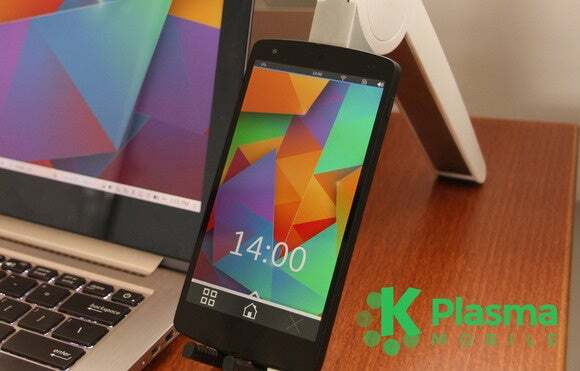 The KDE community just unveiled Plasma Mobile, a free and open-source mobile operating system. This is nothing new for the KDE project. Before Ubuntu Touch was ever announced, the KDE community had a long-term vision of convergence. Plasma 5 on the desktop has a “converged shell” that can switch between different interfaces for different device types. KDE even attempted to release tablets with their Plasma software preinstalled, but this never worked out. Unveiled at KDE’s annual Akademy world summit, the KDE project pitches Plasma Mobile is unique—different from both the dominant mobile operating systems and even different from Ubuntu for phones. Plasma Mobile is entirely free and open-source software, and the announcement argues the benefits of that. It can be distributed, modified, and re-used with no restrictions. It’s developed with an open development process anyone can get involved in. It’s privacy-focused, and you can choose “services from trusted sources” instead of relying on the ones the operating system developer chooses for you. Customization and personalization is also a big headline feature, which is no surprise. KDE has always been much more customizable than other popular Linux desktops. Unlike Ubuntu for phones, Plasma Mobile is trying to support as many different types of apps as possible. It “is designed as an inclusive system, intended to support all kinds of apps.” Native apps can be written in QT, KDE’s toolkit of choice. But Plasma Mobile will also support GTK apps, Ubuntu Touch apps, Sailfish OS apps, and even Android apps. It probably isn’t a coincidence that Shaashlik, a framework for running Android applications on “real” Linux systems, was just shown off at Akademy 2015. This tool could also bring Android apps to desktop Linux, too. Ubuntu phones are facing some tough reviews due to a lack of native apps, with many reviews saying scopes and web apps just can’t replace the native apps found on other platforms. Supporting a wider variety of apps—especially Android apps—could make Plasma Mobile more compelling in the long run. After all, even Microsoft will support Android apps with Windows 10. Android app compatibility didn’t save BlackBerry, though. The current images for the Nexus 5 feature Plasma Mobile running on top of Kubuntu. This isn’t just a re-skin of Ubuntu for phones—Plasma Mobile is built on top of KDE technologies like the KDE frameworks, Qt toolkit, and Kwin window manager. It even uses Wayland, the display server most of the Linux ecosystem has adopted. Ubuntu for phones uses Mir, arguing that Wayland was unsuitable for its vision of convergence. Despite these differences, the current Nexus 5 images shares a lot of plumbing with Ubuntu for phones. It even uses the ubuntu-device-flash tool for flashing the image onto a phone. Overall, Plasma Mobile looks promising. Linux offers many different desktop environments—it’s only fitting that there should be multiple competing interfaces for smartphones and other touch devices, too. The KDE community has had their eyes on convergence for a long time, so it’s good to see it jumping back into the ring.